The Tsugaru Shamisen was developed in the Tsugaru Region. Please enjoy the dynamic performance of the Tsugaru Shamisen. 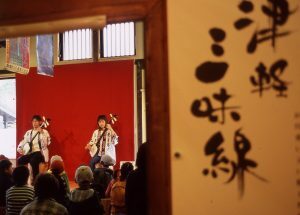 Tsugaru-han Neputa Village’s Sangendo has a daily live performance of the Tsugaru Shamisen. Due to the efforts of the Tsugaru Shamisen Aomori Prefecture Association (Chairperson: Toyokatsu Fukushi), we are able to have a place where you can hear a live performance of the Tsugaru Shamisen throughout the year.Thanks to the efforts of the first chairperson and the person who established the Tsugaru Shamisen National Association, Chisato Yamada, when the Tsugaru-han Neputa Village went under renewal, we were able to have created one of our main attractions. Please enjoy listening to the Tsugaru Shamisen which can be heard vibrating from beyond the beat of your heart. Sangendo is on the route of the Tsugaru-han Neputa Village visitor’s course.For more information on the visitor’s course click here. Admission is included in the Tsugaru-han Neputa Village admission ticket. Performance time is about 10 minutes. The 9:00 AM performance will only be held from April 23rd to May 5th and from August 1st to August 7th. The 4:50 PM performance will be held in the Neputa Hall. During busy times, the performance may be held in the Neputa Hall, please listen and look for announcements or ask a staff member for more information. There may be a change in performers. From April 21st to May 5th and from August 1st to August 7th there will be two performers at a time. Tsugaruhan Neputamura, All Rights Reserved.